I just spent the best part of today reading 480 pages of a story that so closely resembles one I wrote in 2009, it is quite weird. I would barely even have to edit my novel for it to be a perfectly adequate sequel to More Than This, though potentially more plot-driven than character driven. And, to be fair, Patrick Ness has done a much better job than I did, though mine was satisfyingly more survivalist! But anyway, enough lamenting my unpublished works, how did I find Patrick Ness? I found him rather good. 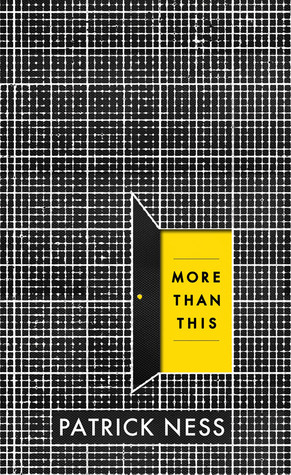 More Than This is the story of a teenage boy called Seth who dies in the opening chapter. He wakes up in a deserted town in England, breathing and resuming normal bodily functions, but still quite aware that he died. We journey with him as he recalls exactly how he passed away and why he has ended up in what he thinks may be a bizarre and unexpected representation of hell. I don’t think anyone picked up this book knowing what was in store for them. Personally I thought it would be a bit like The Lovely Bones by Alice Sebold, maybe with a twinge of something more paranormally sinister thrown into the mix. The writing style is reminiscent of James Dashner; simple but effective. And also way better than James Dashner. It’s ridiculously suspenseful, ending pretty much every short chapter on a cliffhanger, which is a cheap trick but it bloody works so more power to you. What I hate though is fabricating suspense for the sake of it, which did happen on occasion in this book. I won’t add spoilers through quotes, but sometimes it did feel like a Misleading Moriarty Meme. But despite my feelings on the cheap tricks, I admit I couldn’t help but fall for them anyway. I did really devour this book, it kept me on my toes (or, well, sitting comfortably on the couch, but figuratively…) and wondering what was going to happen next. I’m the kind of person who likes to guess where the plot’s going to go – simply because I can’t not – and though I guessed some twists, I definitely wouldn’t call them predictable. Most importantly is the ending, which was not expected at all. Not in how it turned out, but the execution. You’re expecting to find the answer and to have the conclusion of the story wrap the story up nicely. In the end it’s not about how the story ends with More Than This, but about the overall message and what the characters have learned. And that’s something I truly have missed in the more plot-driven novels I’ve been reading lately. Yes, it is character-driven so that does mean some may find it lacking plot-wise, but I don’t think it did. I was fully invested in the story just as much as the characters, and oh boy how I loved them. Seth is the first main character I have really connected with in a while. His struggles can be felt by any reader in some way or another. Some readers may find that Seth’s story completely mirrors their own, or at least someone they know, and in the end every single one of us can relate to his journey. The secondary characters are also well-written. Tomasz is amazing and I completely adore him. He’s one of the best secondary characters I have ever seen – he even rivals Zuzana from Laini Taylor’s Daughter of Smoke and Bone, that is how much I loved that kid. Regine I didn’t like as much, but she was still an excellently crafted character – no sign of 2D character syndrome with Patrick Ness! I’d recommend this to any young adult (or someone who appreciates the YA genre), especially if you’re going through a tough time (content may be triggering). It’s the type of read that can be finished in a day but will leave you pondering it for a good while after. If you like your YA sci-fi to be high-quality, character-driven with plenty of suspense and major feels I’ve a feeling you might enjoy this one.